Tenjin is the main shopping area of Fukuoka city, a modern area full of shopping centers, shops and restaurants of all kinds. 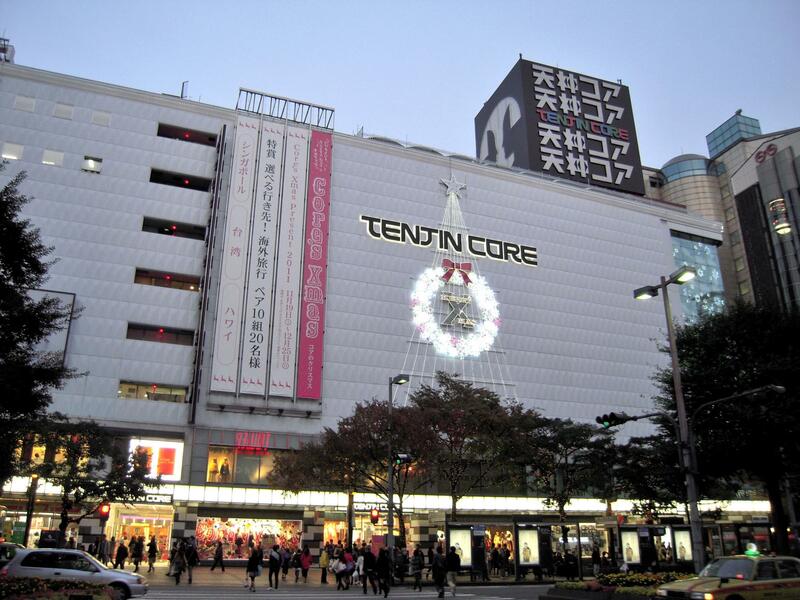 The biggest department stores are Mitsukoshi (11 floors), Tenjin Core (11 floors), Tenjin Vivre (10 floors), IMS (9 floors), Daimaru (8 floors, 2 buildings), Iwataya Honten, Mina Tenjin, Parco, LOFT, Vioro, Solaria Plaza, Daiei Fukuoka (there's a Daiso 100 Yen Shop on the 7th floor), all marked on the map at the bottom. 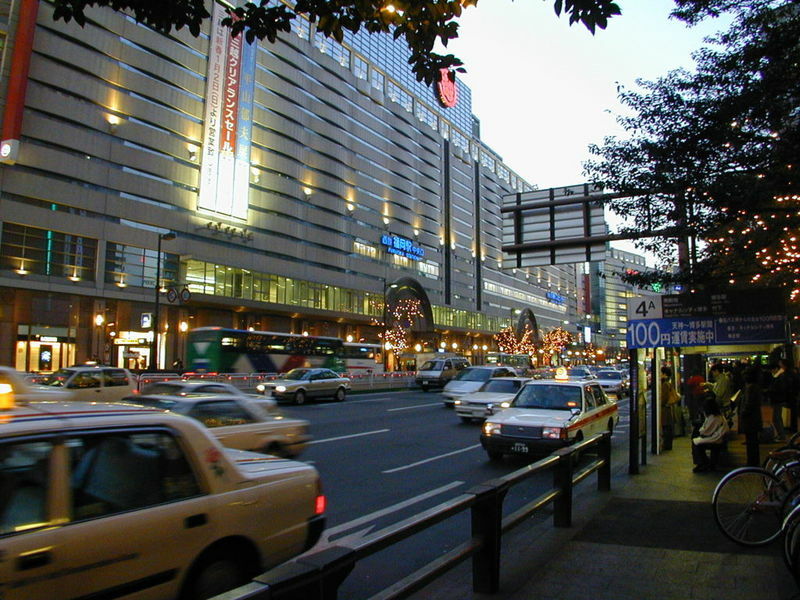 In addition, below the streets of the neighborhood, in particular between Tenjin and Tenjin-Minami station, there is another shopping mall of 150 shops, Tenjin Chikagai. For those who prefer to go shopping in the traditional covered shopping arcades (shotengai), a few steps from Tenjin station you can fint the Shintencho Shopping Arcade, with about 90 shops and restaurants. Daimyo is a small area west of Tenjin station, an area whose restaurants, cafes and boutiques are considered by the people of Fukuoka among "the coolest" of the city, with an atmosphere sometimes hipster, sometimes vintage. For those looking for nightlife, night bars and night clubs where to dance, meet people and drink until late at night, there's this little street near Tenjin Station. The area is very popular with foreigners, and some places are also owned by foreigners living in Japan. Fukuoka Castle, built in the early 17th century, it was long the largest and most important castle of the Kyushu region, but it was dismantled from 1871. Today, on its ruins, there is a large park, known as Maizuru Koen, a very popular place for spring picnics under the cherry trees in bloom (hanami). Scattered here and there around the park you can find various ruins of the ancient castle of the city. 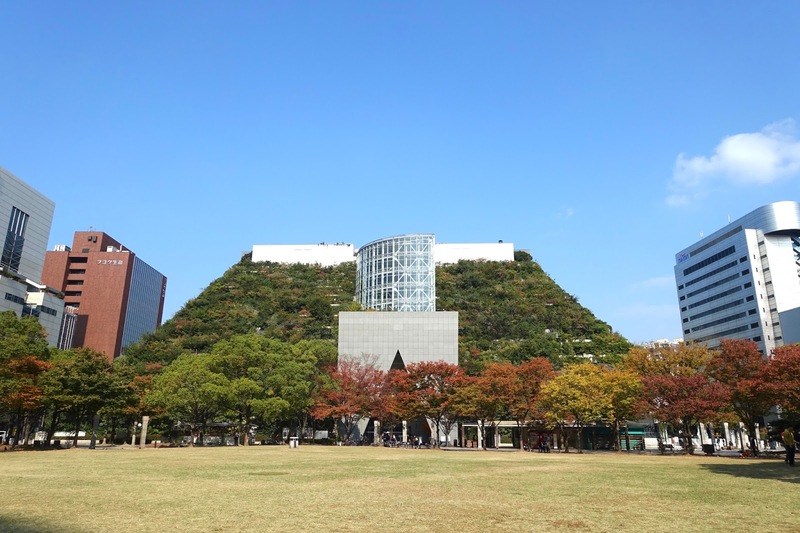 Not far from this park there is another park (Ohori Park), a museum (Fukuoka Art Museum) and a shrine (Gokoku Shrine). A large park located a few meters west of Maizuru Koen (see above). At the center the park there is a large pond, crossed by three bridges connecting three small islands built in the middle of the pond, and surrounded in all its circumference by a jogging track and a number of benches. 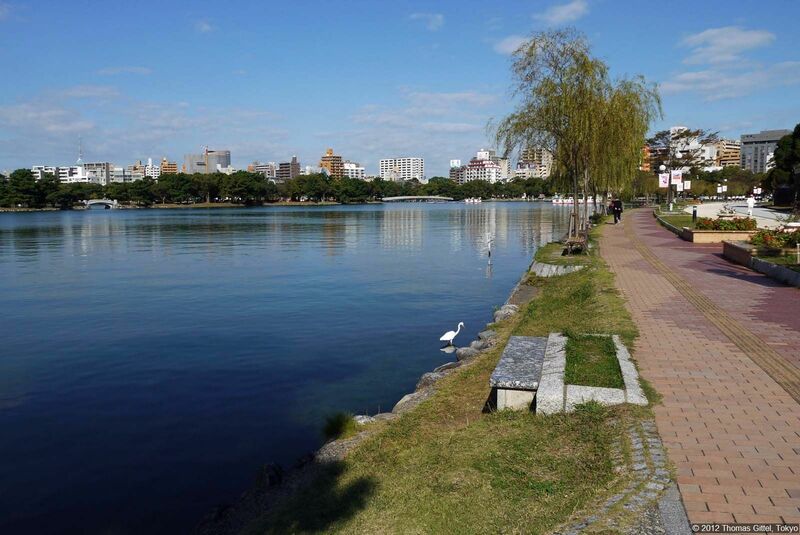 This place is one of the most popular among the residents of the city to do exercise or to walk and relax. In the southern part, not far from the Fukuoka Art Museum (see below), there is a small traditional Japanese garden (admission 240 yen). An art museum located in the south of Ohori Park, on the banks of the pond. This museum closed on September 1st, 2016 for renovation works. Reopening is planned in March 2019. A Shinto shrine located a few steps away from the 'Ohori Park and Maizuru Koen. Along the way to get there, you will pass through a huge entrance gate (torii), which happens to be the largest torii in raw wood (cypress) in all Japan. Beyond this, there is not anything special for which it is worth a special visit, but if you're in the area you can go take a look. The shrine is quite popular among tourists because of its proximity to other tourist attractions and it is also very popular for wedding ceremonies. A large park located about 1.5 km north of Ohorikoen station. It is not easy to get there, because it is far from the nearest station and because it is situated on a hill, so you have to walk a lot reach the top. From its top you can enjoy a sea view. 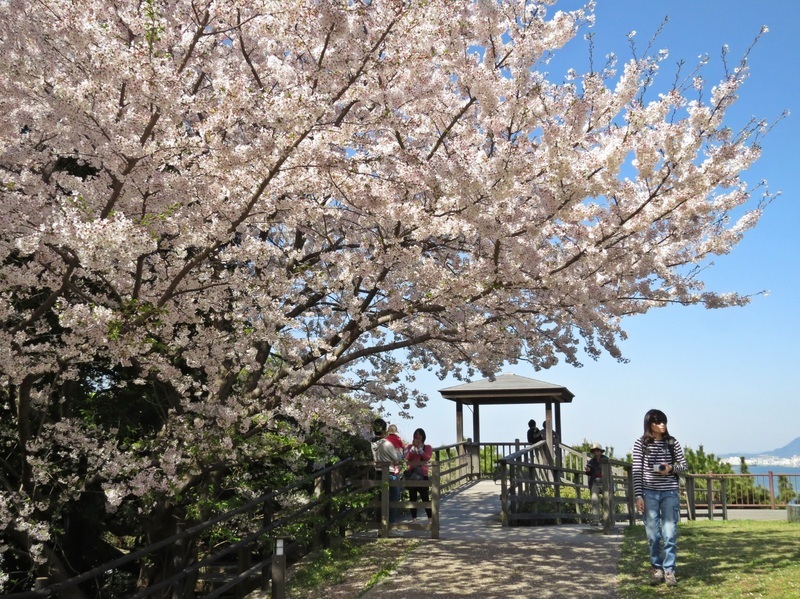 For these reasons, very few tourists visit this park, although it is part of the "list of the 100 best places in Japan where to see hanami", on its grounds there are about a thousand cherry trees. You can get to the top also by car, so if you want to visit it but you are too lazy to walk there, you can take a taxi. About 700 meters east of Tenjin station you can find this building, a place of particular interest for lovers of architecture. It opened in 1995 after 3 years of construction and it was designed by the Argentinean architect Emilio Ambasz. This building is one of the first examples in the world of bio-architecture. 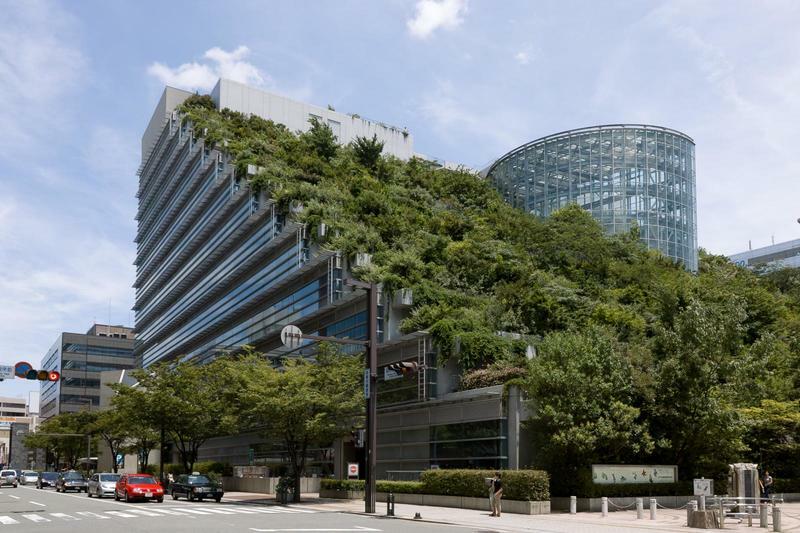 One of the sides of the building is indeed constituted by a series of terraces covered by a thick vegetation, a kind of vertical garden which ideally is a continuation of the public park located in front of it, the Tenjin central park. On the roof (15 floors) there is a panoramic terrace (free of charge, 10-16). Inside the building houses various things, including a concert hall, an art gallery (Takumi Gallery) and a tourist information center for the entire Kyushu region (2F). About 700 meters north of the metro station Akasaka, you can find the Fukuoka Fish Market. The area where there is the buying and selling of fish products is usually closed to visitors, except on the second saturday of every month, from 9 to 12, the only day open to the public. During the other days you can still go in the area, freely enter into a building called Fukuoka City Fish Market Center and have a seafood lunch at one of those cheap restaurants inside. From the second floor of this building you can also start walking along a raised path from which you can see the market from abouve, without interfering with people at work. From the 13° floor of the same building you can also enjoy a beautiful view of the sea and the surrounding area. If you wanted to visit a fish market and you've been disappointed to not to be able to get into the market of Nagahama, you can visit this market, located south of Tenjin, about 400 meters from the subway station Watanabe-Dori. In this place there are approximately 60 fish shops. 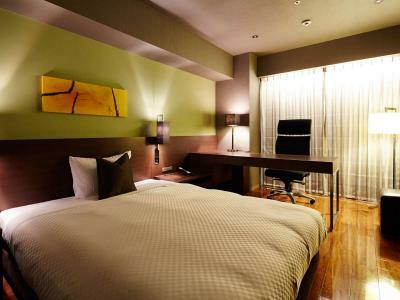 Tenjin is one of the best areas to stay in Fukuoka, it is important to choose a hotel just a few steps from one of the metro stations in the area, preferably near Nakasu or the area between Tenjin station and Tenjin-minami station. For more tips check out the guide of Nakasu or the page Where to stay in Fukuoka. 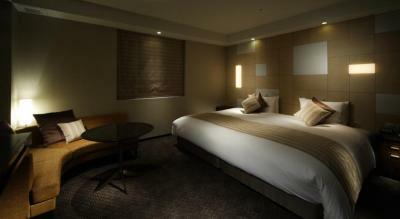 A business hotel located right next to Tenjin station, in the heart of the city. Rooms are very small and the hotel isn't anything special, but it isworth the little money it costs, especially considering the location (it couldn't be better). 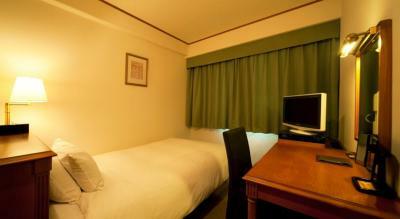 Single rooms from 5,000 yen, double rooms from 8,000 yen per night. A big hotel in the area with the most stylish restaurants and cafes of the city, Daimyo, a few minutes on foot from Tenjin station. Maybe it is the best hotel in the area as for value for money, if you are not looking for anything sophisticated. 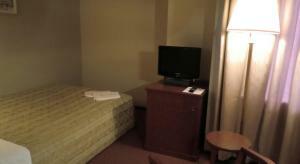 Single rooms from 5,500 yen per night, doubles from 7,800 yen per night. Big breakfast buffet at 1080 yen per person. 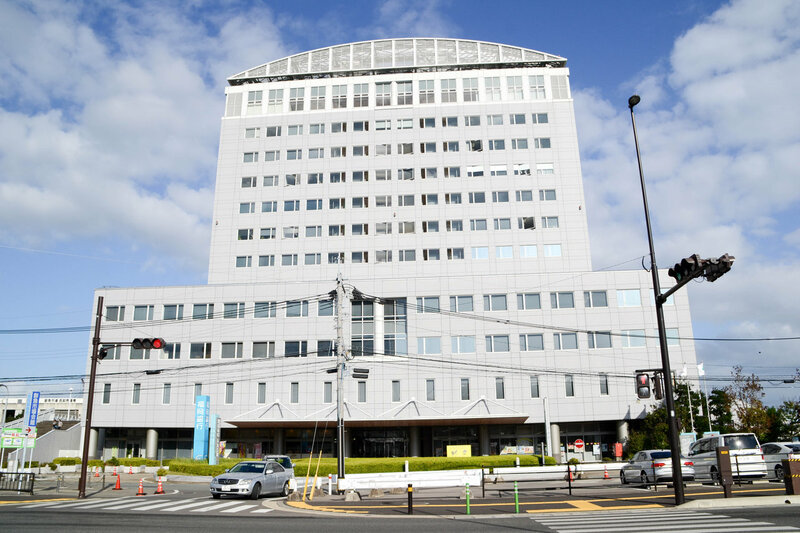 A hotel belonging to a widespread and highly reliable chain of Japanese hotels (Unizo), located just a few minutes from Tenjin Station. Rooms are modern and elegant, and much more spacious than average. Single rooms from 10,000 yen, doubles from 14,000 yen per night. The area is well served by the subway. The most convenient station to get to the shopping area is Tenjin station (Kūkō Line) and Minami-tenjin station (Nanakuma Line). To get to Ohori Koen and Mazuru Koen the closest station is Ōhorikōen station (Kūkō Line).